With no end in sight about the current shortage of Liquefied Petroleum Gas (LPG) in parts of the country, consumers especially businesses in Ho have been forced to look for alternative sources to sustain their operations. Checks at some food joints in town revealed that, some of the operators who still use LPG during this period, have acquired spare cylinders that they have filled down at an extra cost while others who cannot afford have reverted to the use of ‘fuel wood’ and charcoal in preparing their meals with the hope that, the situation would normalize sooner than later. The severe shortage has also led to a virtual halt in taxi services within the municipality for the past two weeks leaving the few taxi drivers operating in the municipality to charge exorbitant fares from passengers, in the evenings especially. A visit to ‘King’ filling station the only station in Ho that have some supplies, Tuesday morning showed an unending queues of taxis as well as domestic gas users waiting anxiously for the supply of the commodity, which was expected to be discharged later that afternoon. Some drivers in the queue said they had to pass the night at gas station because ‘they do not know when the consignment may arrive’ while others said they got up as early as 2am to join the queue. An attendant at the gas station said though they have had consignment over the weekend, it got finished due to the high demand and they were expecting to replenish supplies that afternoon. Gilbert, a taxi driver said the search for the commodity is ‘exhausting and frustrating’, hence he is considering reverting to the use of petrol, though he conceded that gas is cheaper. He said the gas shortage has also taken away the excitement in the job as it has affected his daily sales and suggested angrily that the authorities should place a total ban on the use of LPG by vehicles, ‘if they cannot sustain regular supplies’. A visit to some other gas stations within the municipality had the ‘No Gas’ inscription displayed on the premises. 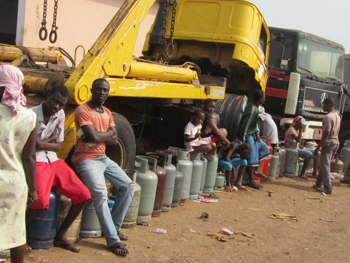 Meanwhilethe current Gas shortage is expected to be over within the next 6 days; according to deputy Energy minister Alhaji Inusah Fuseini. Speaking on Tuesday about the situation in an interview on JOYFM in Accra, the minister said that a mechanical malfunction at the Tema Oil Refinery (TOR), which has obstructed operations there for weeks, was just remedied. He is therefore optimistic that the backlog of work should be cleared in 6 days, at which point the plant will resume putting out oil. Alhaji Fuseini also noted that the Ministry of Energy had received approval from the Environmental Protection Agency (EPA) to use the Takoradi Harbor as a loading point for trucks to collect fuel, which they will deliver around the Western, Central, and Ashanti regions to address the present shortages there.